Human beings are social creatures and love to celebrate the bonds of love and kinship which ties them to one another. The festival of rakhi is one such event where people celebrate the love between a brother and sister. It's really heart-warming to see, how brothers and sisters make plans for months in advance to surprise one another. 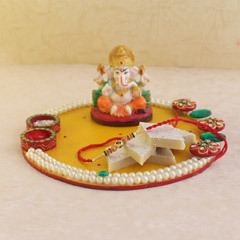 You can now browse through our collection of best-priced goodies and rakhi collection and send rakhi to Amravati. At Send Rakhi, we make Raksha Bandhan shopping easy for you with a user-friendly portal. Our wide range of gift products are perfect for our national as well as international customers. In India, our extended family forms an integral part of our life. Now along with your brother, you can send rakhi to Amravati for your cousins and other family members using our exclusive set of rakhi. You can send a set of two or three rakhis depending on the size of your family. If you brother is staying away from you, pleasantly surprise him with a set of two rakhis, one for him and another one for his best friend. Apart from rakhis, you can also check the wide variety of other gifts like flower bouquet, chocolates, cakes, and personalised items available here.